Fifty years ago, a Nobel Peace Prize-winning icon of the civil rights movement was murdered in Memphis while fighting for 1,300 black sanitation workers from AFSCME Local 1733. He gave his life for those workers. When his widow considered what it would mean to have a holiday honoring Dr. Martin Luther King, she remarked it would be the first American holiday for someone killed in a labor struggle. He was a prophet and a genius, a bold visionary who could lead America into a better tomorrow through a deep and abiding faith. The heart aches to think of what could have been achieved had he lived even one more month. The magnitude of the loss is incomprehensible to this day. Over the last year, UNAC/UHCP has examined his life and his work. Earlier this week, we looked at his second-most famous speech, where he connected world history, a string of revolutions occurring in countries worldwide in the 1960s, the black sanitation workers’ strike, and then seemed to predict his own death. 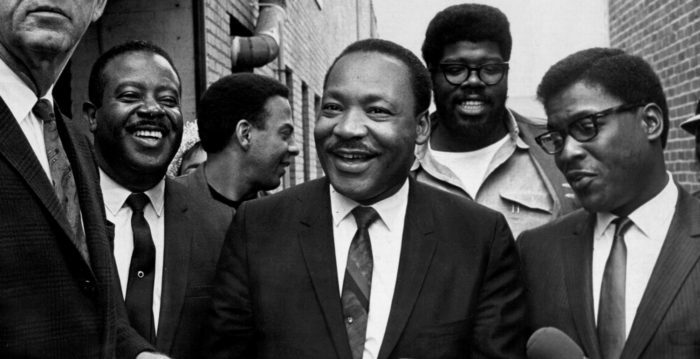 To Dr. King, his calling was to use the gospel to raise up the lowest among us. When he was assassinated, his poor people’s campaign was just getting off the ground, a natural outgrowth of the work he had been doing with the labor movement and unions for years. May the words Dr. King spoke half a century ago inspire those still fighting for the dream he imagined for all of us. Rest in power, Dr. King. Read the entire series on Dr. King here.